Fall is in full swing here in the South! We woke up to 38 degree temperatures, and our highs haven't been out of the 60s for a few days. I love the consistently crispy cool temperatures! I love the leaves changing colors! I love seeing little fingers wrapped around steaming mugs of hot cocoa while we settle in for a movie night! 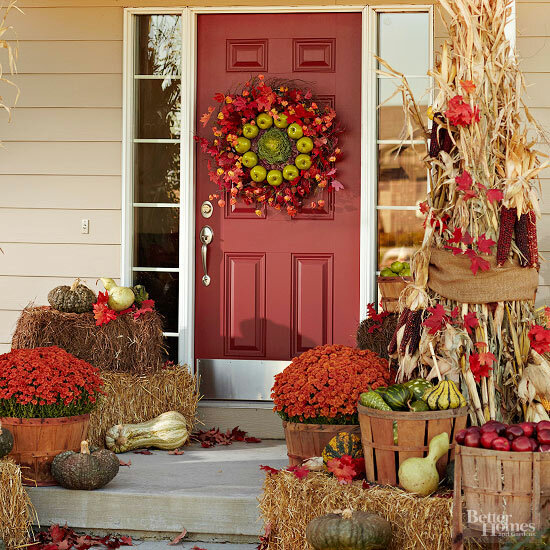 And I love love love all the beautiful fall decorations! We started our decorating last week. We are going for a mostly Halloween look at the moment with spider webs and a skeleton, but I want to add several pumpkins. I found some beautiful green fall decorating ideas that I hope can inspire you to get in the fall spirit! I don't think you can get more all-inclusive than this style! Food, and foliage, and gourds, and hay... BHG has incorporated nearly every nature aspect of fall here. The wreaths look easy to put together, and if you can get your hands on the wooden bushel baskets you're golden! Whether it's strung in a garland, surrounding a fragrant candle, used in making table-top topiaries, or simply piled high in a beautiful glass jar cranberries make the perfect fall decoration. Their deep red color just screams autumn, they are incredibly versatile, and did I mention they're beautiful? And finally, another beautiful setup from BHG. 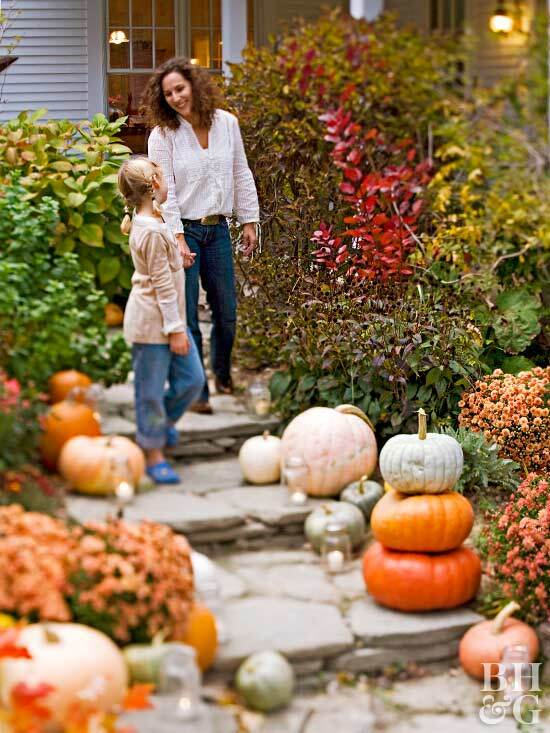 I adore the look of all the pumpkins scattered in the walkway, and can you imagine the ambiance and warm glow that the jarred candles give the path at night? It's spectacular, and probably my favorite!